To order the current or back issues as a member of De Re Militari, see our subscriptions page. Warfare is one of the central themes of medieval history. Medieval society was dominated by men who considered themselves more soldiers than landlords, judges than administrators. More of society’s resources went into fortifications than cathedrals; deeds of arms were a topic rivalled in literature only by love; and in many times and places the common people dreaded war far more than famine or plague. War was the greatest force in determining the evolution of medieval governments. Although the study of war, its conduct and its impact, has never been absent from medieval historiography, the past few decades have seen this field rise to new prominence.Until now, however, there has been no journal dedicated specifically to this area. 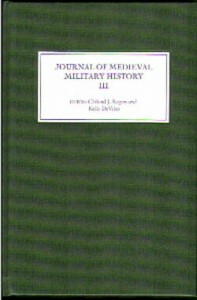 The Journal of Medieval Military History, the annual journal of De Re Militari (published for the Society by Boydell) remedies this situation by publishing top-quality scholarly articles on topics across the full thematic and chronological ranges of the study of war in the Middle Ages.For ordering information, see the Membership Page. Pingback: Should the Hundred Years War have an apostrophe?